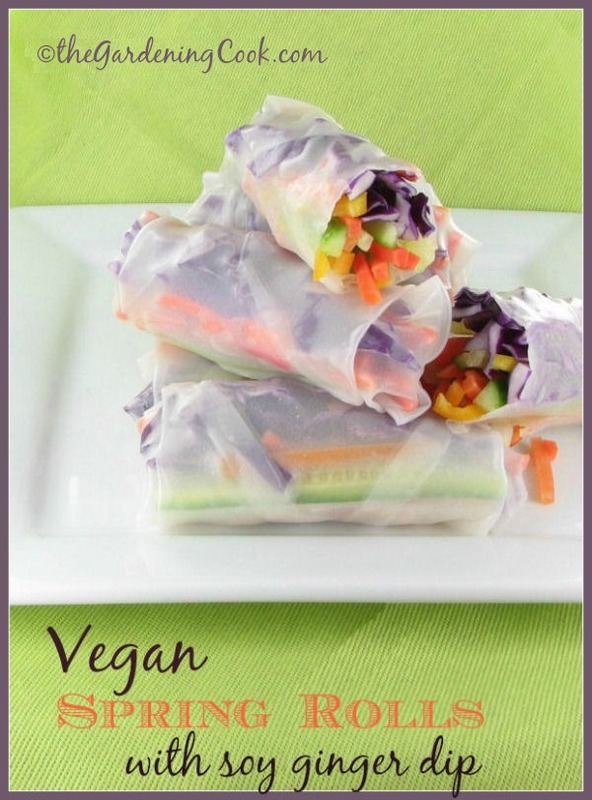 This recipe for vegetable spring rolls is perfect for your Vegan friends but will also tempt the most ardent meat eater. I served them at a party recently, along with a table full of meat dishes and the dish was the hit of the party. Be sure to make the soy sauce dip. They make the recipe complete. Do you love those the yummy vegetarian salad rolls with the spicy lime dipping sauce that you get at your favorite Vietnamese restaurant? Here is my homemade verions of them. I love the way they turned out. 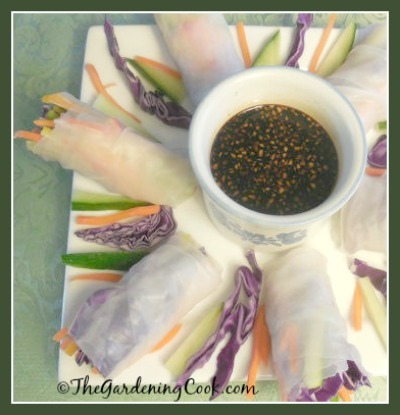 These Oriental Inspired Vegetarian Salad Rolls were a hit at My Holiday Party. My daughter was home a few weeks ago and she is a vegan, so I gave her the job of assembling the rolls for the party. She did a fabulous job! It is odd that I wanted this dish for her and yet it was so popular with the guys at the party too, who love meat. Cut up your veggies first. 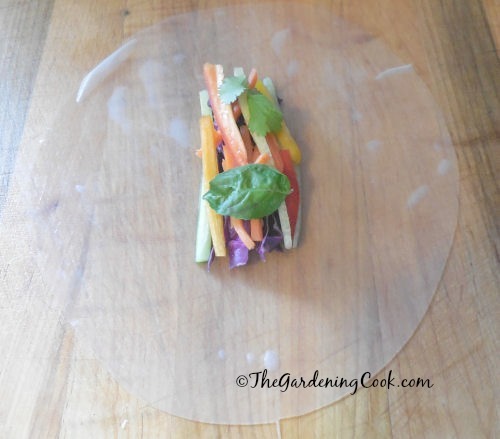 Most are cut in thin julienne strips. Any vegetables will do. 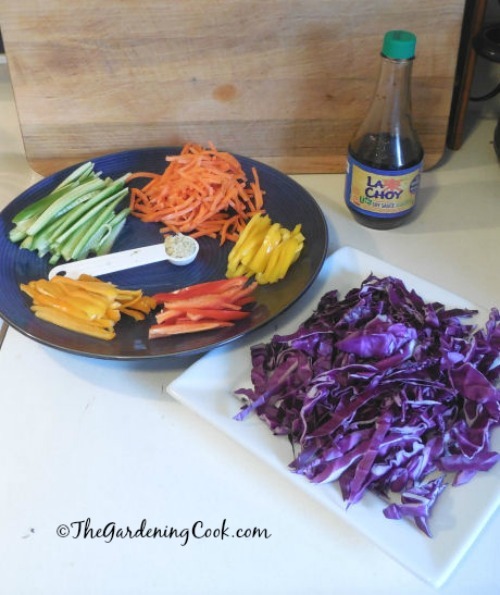 Jess used shredded red cabbage, carrots, cucumbers, carrots, and three colors of sweet peppers. One thing that made this job so much easier and faster was to use my hand held Briefton’s Manual Food chopper. 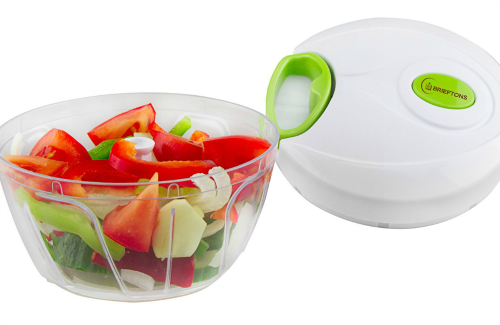 (affiliate link) I had a chance to try this handy kitchen gadget out recently and it makes chopping veggies a cinch. We also made them for a second party and added avocados to the line up. Both were delicious. You will also need soy sauce (We used light so it would not be too salty) and grated ginger. Ingredients not shown are rice paper wrappers as well as basil and cilantro leaves. 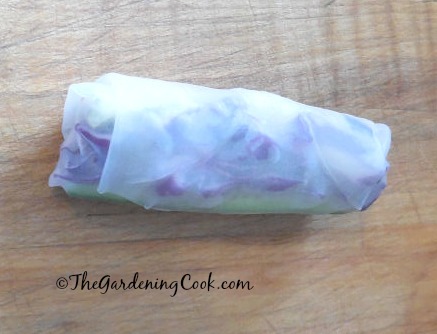 Place each rice paper wrapper in hot water so that it is pliable. Jess found that putting the new wrapper in as she prepared each roll made the process go faster. Add a bundle of the veggies and one basil and cilantro leaf in the middle of each roll. Fold in the sides first, then roll from the side nearest to you to the opposite end. The rice paper will stick to itself. Continue making rolls until all the ingredients are used. Combine the soy sauce and grated ginger to use as a dipping sauce. Note: soy sauce is not gluten free. Use Tamariinstead of you want yours to contain no gluten. 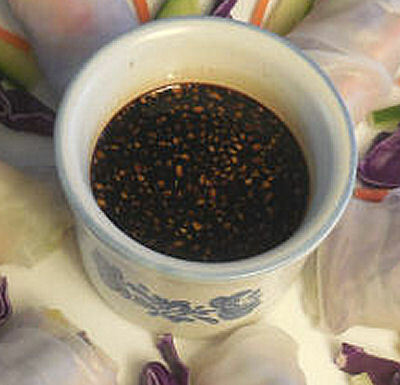 Serve the vegetable rolls with the soy dipping sauce. They really are so delicious and healthy as can be. I used dried rice wrappers for the wrappings, and combined them with fresh veggies for a tasty start to any Oriental meal. For more Vegetarian recipes, please see my Pinterest Vegetarian Board. 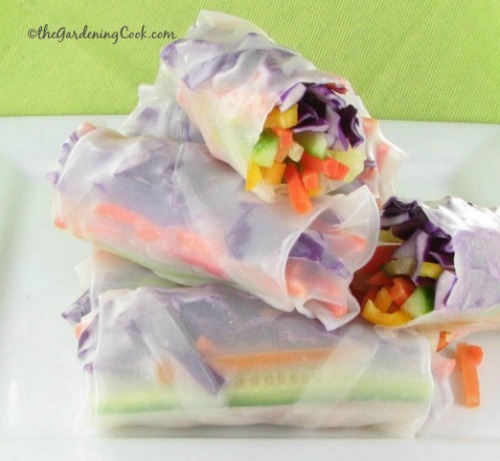 What do you think of rice papers for vegetarian salad rolls? Would you prefer the crispy crust of a normal spring roll, or do you like rice paper rolls? Please leave your comments below. ½ cup Lite Soy Sauce (tamari should be used if you want the sauce to be gluten free since soy sauce may contain gluten. Add a little of each of the vegetables to the middle of the wrap and top with basil and cilantro leaves. Fold the sides in first, then roll from the side nearest you to the other end. The rice paper will stick to itself. Continue making the rolls until the ingredients are done.